Blood cancer stages - Any organic system of the human body can be attacked by cancerous cells, and in this article we’d like to give you a brief information related to blood cancer stages. When one’s suspected with blood cancer, cancerous cells begin to multiply rapidly and they attack different aspects particularly within the circulatory system. It is the bone marrow, lymphatic system, and blood that will be focus of attack. In general, one shouldn’t think there is only one type of blood cancer. There is a few types of blood cancer, all of which will be mentioning below. 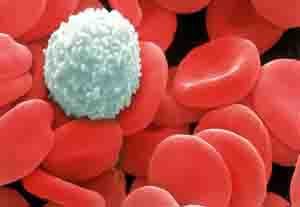 1) Myeloma, which is a type of blood cancer that affects the plasma. The latter is another variety of WBC. 2) Lymphoma, which is a type of blood cancer that affects the lymphocytes, a varieties of white blood corpuscles. 3) Leukemia, a multiplied cancerous cells affect either the blood or the marrow. In turn, this affects the circulatory system's ability to produce blood. It is often marked by the enlarged lymph nodes. Risk level is intermediate and the cancerous cells are not spread yet. Therefore, none other physical organs will be affected by this stage. It is often marked by the enlarged liver as well as spleen. There is still the presence of enlarged lymph nodes too, so there are two organs affected by the cancerous cells. A massive swing also detected, particularly if we look at the growth of lymphocytes.Risk level is moderate. Anemia is developed during this stage. The lymph nodes, spleen and liver are remain swollen. Furthermore, a chance of the cancerous cells that affect two or more organs will be likely higher in this stage. This is the last phase among four blood cancer stages. There will be a drastic fall in terms of rate of blood platelets. Lungs will be likely affected aside of other organs that already affected. Acute anemia will present as well, and this stage is considered more risky than other stages. Knowing more about blood cancer stages will help people with the disease to take some act of prevention before the disease getting much worse.